Some people have noticed that I have not yet posted a list of favorite movies that I watched in the year 2014. I'm not sure I'll ever get around to it. But one of them was So This Is New York. 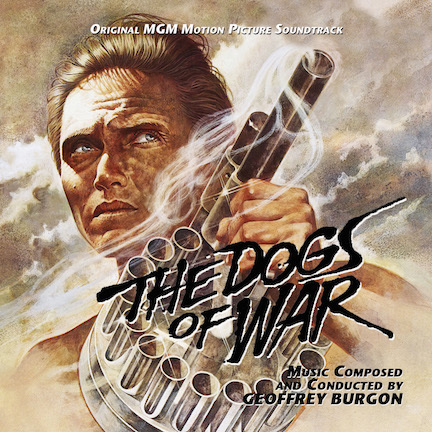 Another one was The Dogs of War, which featured my favorite Christopher Walken performance (so far) and a score by Geoffrey Burgon that will be our 362nd Soundtrack of the Week. Burgon is so good at writing for strings, winds and percussion that it's hard to say he does one better than the other. The listening experience on this CD, a new release from La-La Land Records, is one that alternates between the dramatic, the exciting and the hypnotic. The music gets its hooks into you and pulls you inexorably from one cue to the next. While watching the movie I was so caught up in the story that I didn't pay much attention to the score. Listening to the soundtrack on its own has been a rewarding experience!